Abstract: An historical overview of the state of the art on land and natural resources in order to get into the very reasons why their shrinking is evolving from non violent conflicts into complex and armed ones. The presentation will explore reasons why the grabbing is particularly evident in Africa. An historical analysis will provide elements for a coherent link amongst the economic and ecological crisis and the increasing financiarization of natural resources sector, to conclude with possible (limited) concrete approach/actions proposed by the author. 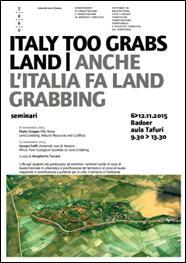 Biography: Paolo Groppo contributes to the implementation of FAO’s programme on land management/territorial development, with reference to Sustainable Land Management and territorial development, including issues such as community property management and gender dimensions. He works for improving methodological tools for territorial development and for providing technical support to the Land Portal database. His experiences cover countries such as Albania, Angola, Bolivia, Brazil, Capo Verde, Chile, Colombia, Costa Rica, Cote d’Ivoire, Ethiopia, Philippine, Guinea Bissau, Honduras, Kenya, Lao PDR, Mozambique, Nicaragua, Nepal, Paraguay, Peru, Dominican Republic, Somaliland, Sao Tomé e Príncipe, Sudan, Tanzania, Tunisia, Venezuela. Abstract: Africa has been and is today a paradigmatic territory for the relationship between geographical settings and human intervention. This seminar aims to reconstruct the long journey of the African man starting from pre-colonial ecological societies, through the colonial Raubwirtschaft and the emergence of megacities to arrive to today’s problems, such as Land Grabbing, and possible large scale solutions implemented by international organizations. This path is marked by the complex relationship with the natural and social resources and the continuous patient modification of the territory in a process that can offer operational horizon for the search for new paradigms at a global scale. Biography: Jacopo Galli graduate at Parma University and Università Iuav di Venezia and obtained his PhD at Iuav, with a thesis title: Tropicale Toolbox Fry & Drew and the search for an African Modernity. His fields of research are modern architecture in Africa, multiscale continental projects and the role international organizations in development projects. His interests are in African architecture and sustainability in buildings and built environment.